Paramore have released the deluxe edition of their 2013 self-titled album, which can now be streamed in its entirety below. 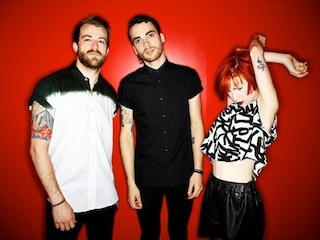 “Paramore: Self-Titled Deluxe” is highlighted by a wide range of previously unreleased material, a new version of the band's fan-favorite, “Hate To See Your Heart Break,” featuring duet vocals from Joy Williams (formerly of The Civil Wars). The release also includes the never-before-heard 2012 demo, “Tell Me It’s Okay,” two bonus tracks “Escape Route” and “Native Tongue,” and 8 electrifying live tracks recorded this past summer at Denver’s world famous Red Rocks Amphitheater. Paramore: Self-Titled Deluxe is available now via Fueled By Ramen.